Romain Grosjean's acceptance that he needed to change his ways in Formula 1 was a key factor in helping him convince his Lotus chiefs to keep him for next year, AUTOSPORT has learned. Team principal Eric Boullier has revealed that Grosjean's on-track incidents had weighed heavy in the team's decision about his future - but that the French driver's willingness to learn and improve helped convince it that he was worth sticking with. Boullier made it clear that if Grosjean had displayed a negative attitude - or refused to revise his approach - then he would have been dropped. "Definitely it would have been different," Boullier told AUTOSPORT, when asked about what the outcome would have been if Grosjean had not been ready to listen. "He clearly showed us, with some feedback from the engineers in the teams, that everything he was taught – and everything he learned – was applied in his understanding of what is a complex matter. "He definitely proved to us that he wanted to do well and it was really clear." Boullier said he received the go-ahead from the team's owners after the final race to seek the best driver he could as partner to Kimi Raikkonen – and that Grosjean left everyone in no doubt he was the right man. "There was a clear strategy from the board to push with two fast drivers so we can be a top team – which means fighting in the top three and going for more wins. "Once we agreed on the strategy, there were some good feelings with Romain but also reservations when you take into account the different aspects of his season. "For [team owner] Gerard Lopez it was important to understand and get feedback about why he [Grosjean] could not deliver as much as we wanted this season. For the medium and long term, we needed his understanding to know where we wanted to go. "And he applied himself very carefully – and the team was happy with the process. He was often in the wrong place on the track, although it was not always his fault, but we needed his feedback to know he understood what we wanted. "After that, the decision was obvious." 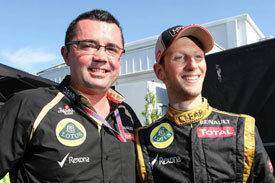 Boullier is convinced that Grosjean will return in 2013 a stronger driver – and back to his best form after a difficult end to the campaign. 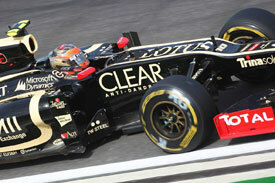 "Being back in F1, it is clear that you need some time to settle as testing is very limited now. "It was clear that he lost a little bit of ground after Spa, because of that decision to give him a race ban, but he showed on a couple of occasions after that about how good he is. We believe in him."